I am not a very good baker. My friend Beth is though. I already shared her coffee cake recipe in an earlier post. I was up in the Twin Cities recently and stayed with her a few days. For breakfast each morning, I had one of her muffins. 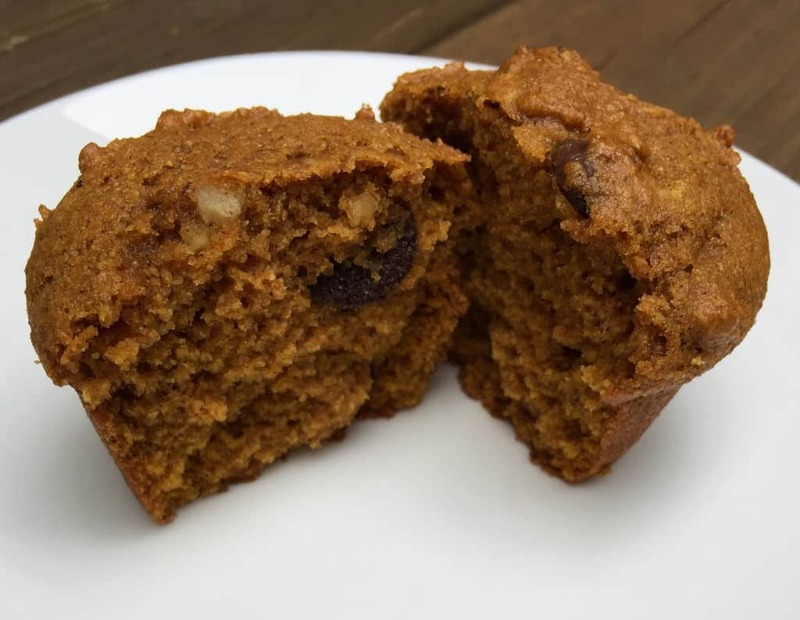 Pumpkin muffins with chocolate chips and walnuts. Of course I asked for the recipe and, of course, they didn’t turn out like hers. I have made them several times since I got home and they were pretty pathetic looking. They tasted good and Meathead and Picky Eater loved them but they stuck to the pan and I mangled them trying to get them out. Beth was perplexed. Yes, I baked them a lot longer than you. Maybe I just can’t bake worth crap. Well since I still had all the ingredients, I tried one more time. I sprayed the heck out of my pan and I followed the recipe almost exactly. They turned out beautifully! They popped right out of the pan, in the stated baking time and actually looked appetizing. Beth got this recipe from someone she used to work with, I think he was a vegan because it calls for egg substitutes and raw sugar. I used real eggs and organic sugar, no idea if that’s the same thing or not. And Beth swaps out some of the flour with rolled oats and ground flaxseed. I tried that, but decided to just use all whole wheat flour. It makes a lot of muffins so I cut the recipe in half to make a dozen. I have to say, I’m glad I kept trying until they turned out. They are really good and kind of healthy I think. Great for breakfast. Thanks Beth, almost as good as yours. In a stand mixer with paddle attachment, beat oil and sugar well. Mix in egg and vanilla. In a separate bowl, combine all the dry ingredients and mix well. 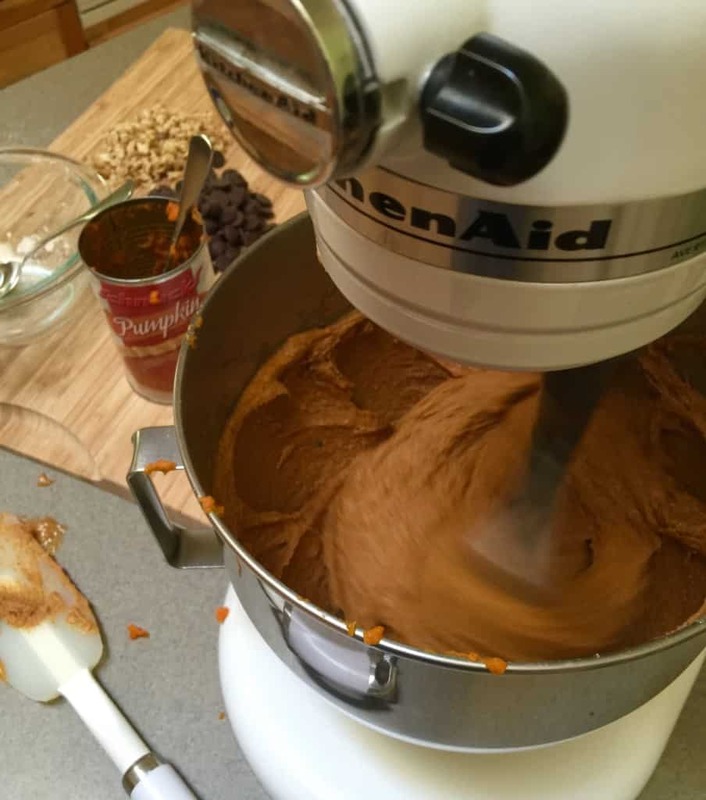 Add the flour mixture and pumpkin alternately, mixing well after each addition. 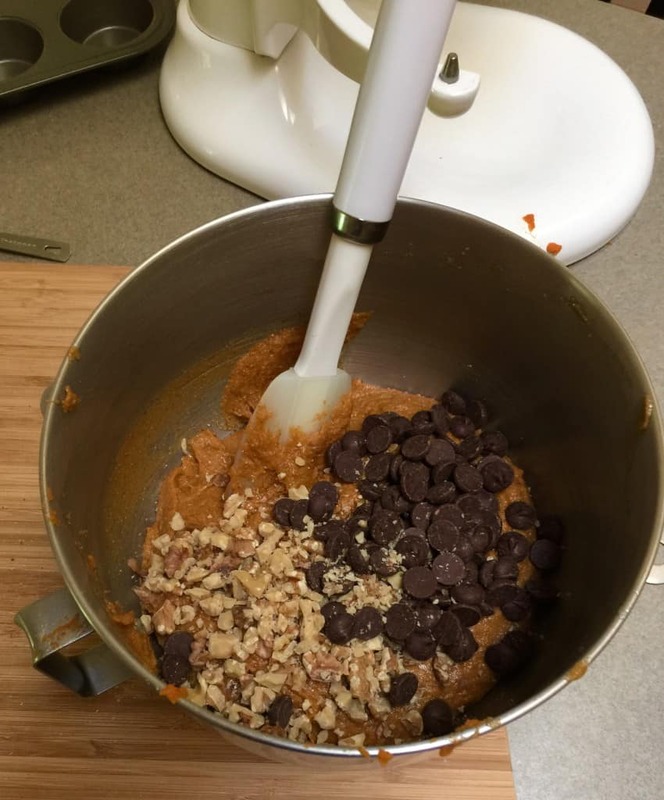 Remove bowl from mixer and fold in chocolate chips and walnuts with a spatula. Spoon into well greased muffin tin. I used an ice cream scoop and put two scoops in each, fill up each muffin cup all the way. Bake until golden and done, about 20-25 minutes. Let cool for a few minutes and then remove to wire rack to cool completely. You can easily double this recipe for two dozen. 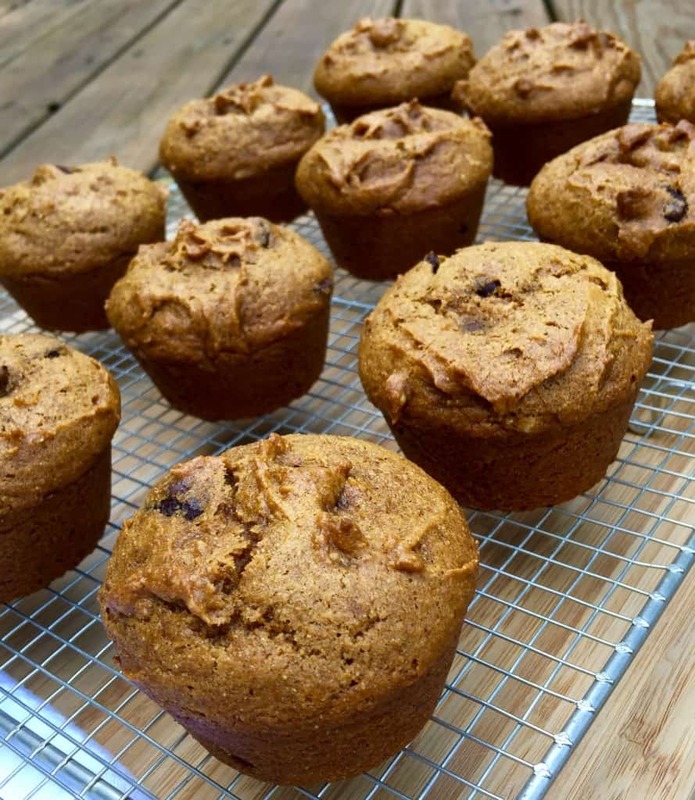 Beth uses 1 1/2 cups whole wheat flour, 3/4 cup rolled oats and 1/4 cup ground flaxseed. She also uses applesauce instead of the oil, not sure how much. Her muffins were very good if you want to try her way. 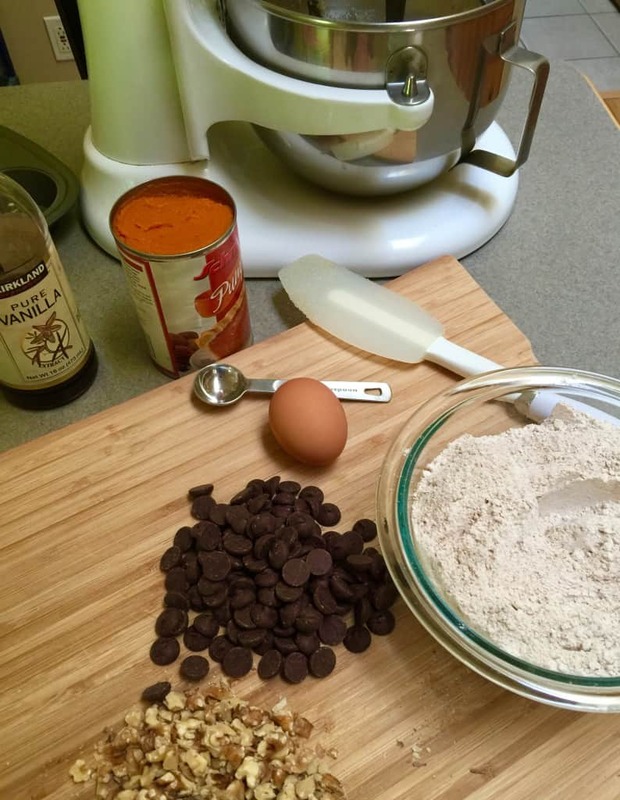 Anytime you can get chocolate into a healthy breakfast item, you’ve got a win! Jill! Thank you. My friend Beth makes the best stuff. 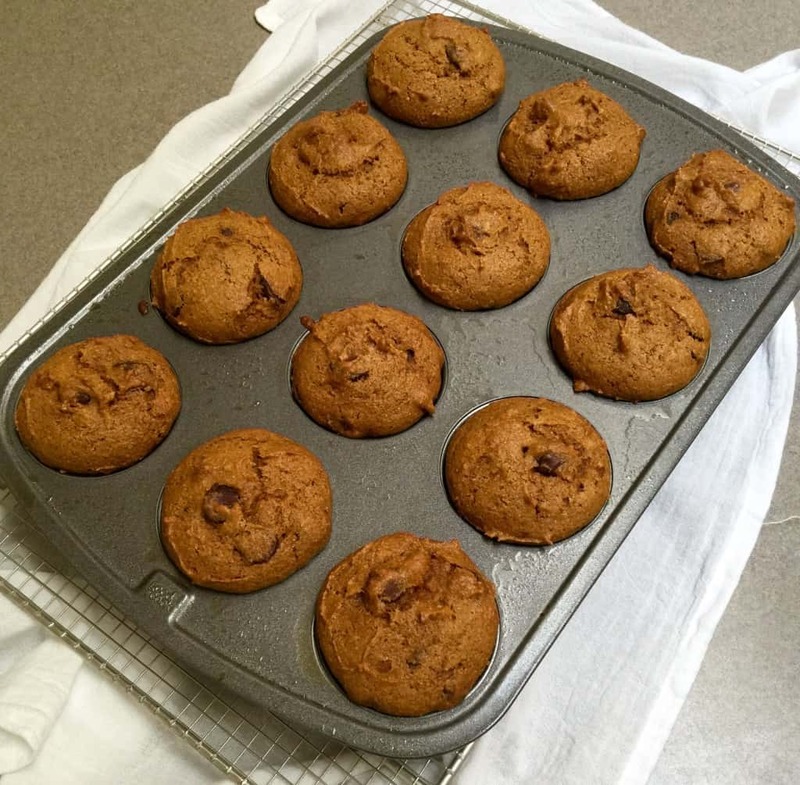 I think they are the healthiest baked item I’ve ever made. Kelly, yours look beautiful! And I agree with Quinn-anytime you can get chocolate in a meal it’s a win-win! !